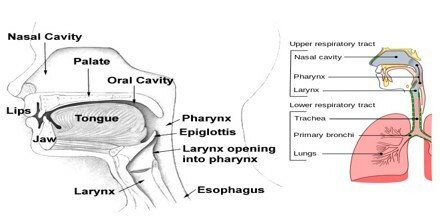 Nasal cavity the cavity on either side of the nasal septum, extending from the nares to the pharynx, and lying between the floor of the cranium and the roof of the mouth. Dust, bacteria, and other particles inhaled from the air are trapped by the mucus in the nose, carried back, swallowed, and dropped into the gastric juices so that any potential harm they might do is nullified. Most air breathed in normally flows through the nose, but only a small part reaches the olfactory clefts to get a response to an odor. When a person sniffs to detect a smell, air moves faster through the nose, increasing the flow to the olfactory clefts and carrying more odor to these sensory organs. Without the nose, the body wouldn’t be able to taste food nearly as well. What humans call “taste” is actually a mixture of different sensations. One of the sensations is smell. When food is eaten, the nose smells the food and sends information to the mouth in a process called olfactory referral. This is why those with a cold or other nose condition finds that food lacks flavor. 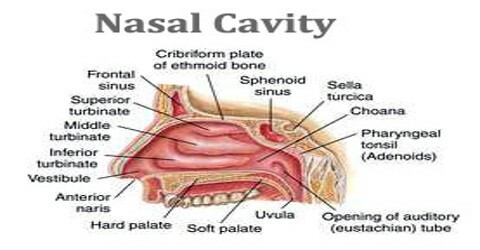 The structure of the nasal cavity helps to enhance the sense of smell. There are grooves on the wall of the nasal cavity called nasal conchae or turbinates. Their shape helps the inhaled air circulate around the nasal cavity and increases the surface area of warm, moist tissue with which the air makes contact. The nasal tissue warms and helps filter, with ciliated epithelium, the air before it travels into the lungs. This is a very direct route from the nose to the brain which helps us react quickly to the different smells that we detect. The brain will identify the smell and give a signal how to respond. Some responses are subconscious, like the smell of baking cookies causing our mouth to water or your stomach to rumble. The voluntary, conscious response may be to go in and a cookie. The same can be said of bad smells. The filthy washroom may cause our nose to wrinkle and we will consciously move away quickly. The two openings in the nose care called nostrils, or napes. 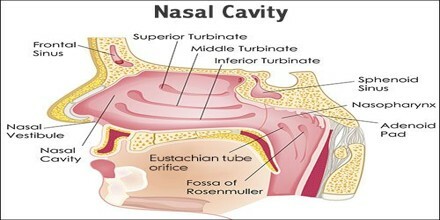 They lead to two nasal cavities that are separated by the septum, a wall of cartilage. Inside the face is an intricate system of canals and pockets of air called sinus cavities. Sinus cavities span all the way to the back of the skull, right above the oral cavity, within the cheekbones and between the eyes and brows. All of these areas are responsible, at least in part, for breathing, smelling, tasting and immune system defense. There is a rich blood supply to the nasal cavity. In some animals, such as dogs, the capillary beds flowing through the nasal cavity help cool the blood flow to the brain. Blood supply comes from branches of both the internal and external carotid artery, including branches of the facial artery and maxillary artery. The most common cause for the loss of the sense of smell is a viral infection, like a cold, Kanowitz told Live Science. Sinus infections, nasal polyps, tobacco use, head trauma and, in exceedingly rare instances, tumors, may also cause smell loss. Some loss of smell also occurs during the natural aging process, much akin to visual and hearing loss. 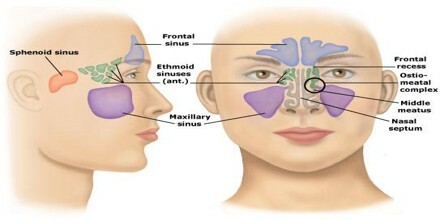 Sinusitis is another common nose condition. The inflammation can come from allergies, viruses and certain diseases. Some symptoms are weakness, fever, fatigue, cough and congestion.